I am conducting some research into the income and earning levels of Nigerian lawyers. There has been a lot of discussion and anecdotal information about how much Nigerian lawyers are being paid (it was even brought up at the Annual NBA National Conference in 2015 ). 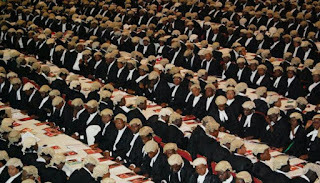 I have heard 'stories' of lawyers who are 5-year post call being paid as little as N50,000 a month by their principals in the firm, and lawyers working in legal departments of companies (generally oil companies) being paid upwards of N1million a month. I like to work with verifiable data and so I am asking lawyers to anonymously conduct this survey with their income levels. The data will be shared publicly once it is collated in case anyone needs the information for research or just general information. This survey is not an undertaking to simply satisfy my curiousity, if you know me personally, you would know that I am passionate about creating solutions that can improve people’s lives. I am currently working on a couple of initiatives and projects with the aim of improving the productivity and income of lawyers in Nigeria, and so this information is invaluable. If you are a lawyer in Nigeria, please click on this link to take the survey (it is anonymous), and takes less than 2 minutes (honest!). If you are not a lawyer, please share this with someone who is.